The Velib’ bicycle program in Paris celebrated its one millionth bicycle voyage last month. If you’re not yet familiar with Paris’s city-sponsored bicycle program, it’s such an innovative and “green travel” program in the form of a public transportation service, that the Velib’, in and of itself, is a reason to visitParis. There’s good news, too: The already efficient and economical tariffs to rent one of the Velib’ bicycles just got even cheaper and more efficient. The Mairie de Paris (Paris City Hall) has made Velib’s more easily accessible for tourists and visitors. The price of a Velib’ for day use is now the same cost as a Metro ticket: EURO 1.70. 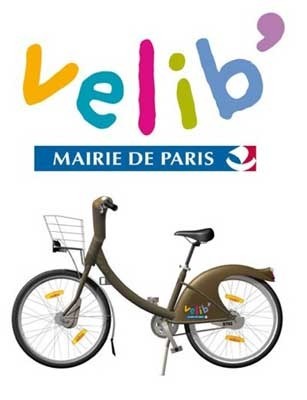 And the price for 7 days access for use of a Velib’ is 5 to 8 Euros with the first 30 minutes of use free. You can get your Velib’ tickets on the internet at http://velib.paris.fr and also at the Mobile Kiosks that you find at every Velib’ station which provide instructions in English. It’s a great alternative to hopping on a bus or the metro or walking everywhere. Click to download the sector maps of Velib’ Stations. Since the Velib’ stations are nearly as numerous in the city as the Metro stations, most people can get where they need to go within a half an hour, drop off the bicycle, and pick up another one for their return voyage after their rendezvous. If you go over the half-hour time allotment per session (not per day), you pay for the extra time starting at 1 Euro for an extra half-hour.